I really like this outfit formula, it looks perfect in both versions. The purple shades in the first version are so wonderful, but I like the second version with blue and grey just as much. Wonderful styling! Good to have gotten the injections done, I know that can be stressful as kids never like needles. Yeah luckily it didn't go too badly with the injections! Happy Friday Mica! I absolutely adore both looks. Layering with a tee was a great idea and the knot added a special touch to the look! I purchased another maxi so I now have two..yaay:)..and I really love both:) Thanks always for the inspiration and I pray you and your family have a blessed weekend. It's been so nice to see you in your maxi dress on your blog recently, you look great in it! Great styling and outfits! I really like the green bag in the first pictures! This is such a cozy look! I should try doing this as well. Thanks for the tip dear. My kids do like their vaccinations. It is a little strange, but I think they are so fascinated by the toys they can pick one from afterwards that they brave the needles without fear. That's a good way to be I think! Love this styling idea for summer! I adore the tie dye maxi dress! This is such a great idea...I think about layering a top over a regular dress, but I haven't done it over a maxi dress!! Brilliant!! Layering a tee over a maxi dress is such an easy easy to change up the look of any dress and the added warmth and coverage can be welcome too especially as the temperature starts to drop. Happy weekend Mica! Yes, it works so well for that! Got to love it when the hubby is off work. I haven't try a tee shirt over a maxi dress before. So going to have a to give it a try. Also the kite fest sound like a lot of fun. Have a great weekend. Little Tyke screams like we're torturing him whenever he goes for vaccination or at least he did in the past. It's always an embarrassing experience. Ugh! Oh no, that would be so tough! I think the doctors are used to it though! maxi dresses really are perfect for transitional weather, and the kite festival sounds like a really fun event for the boys! So cute! Love this look, sweetie! This is such a cute outfit. I love timeless pieces you can wear around the year.I love the skirt with this tee. It is great combination . I love the turquoise popping off the burgundy - well done on that stellar combination. I like the idea of a top over a maxi dress, although tees are too casual for my taste. The kite fest sounds like a blast! We have a really windy point on the water here that a lot of kite-flyers use - it's so fun to watch them! Have a wonderful weekend, my dear! Thanks Sheila! It was nice to think of a different way to wear my tees, and I do like the colours together! I've never tried to wear a tee over a maxi dress, it's an idea to think !!! I liked the second look most. Oh I don't like to see small children take the vaccines, poor little ones their little arms are so delicate, it's still good that you took them off! That's a great idea! You get two different looks that way! Your cooling off and we're heating up here. It's gonna be in the 90s this weekend! Yes it's nice to think of a different way to wear my dresses! :) Enjoy your warmer weather! 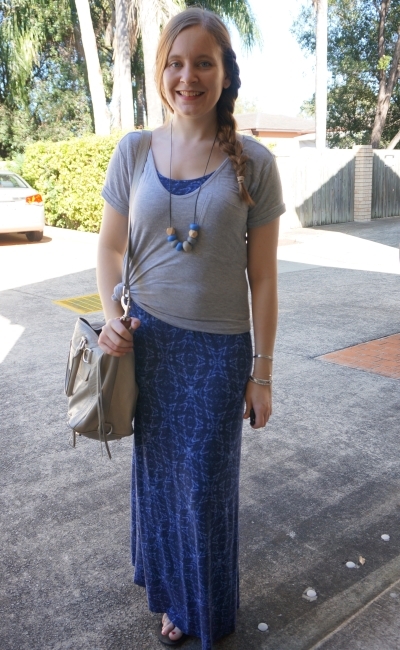 I love layering a tee over a maxi dress too! It's such a cool way to wear your same old dresses :) Super cute! Happy weekend! 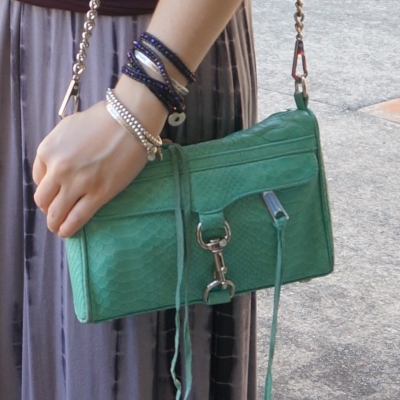 Rebecca Minkoff makes some great bags! Girl I love the first purple outfit.. well done! Love the blue and grey! 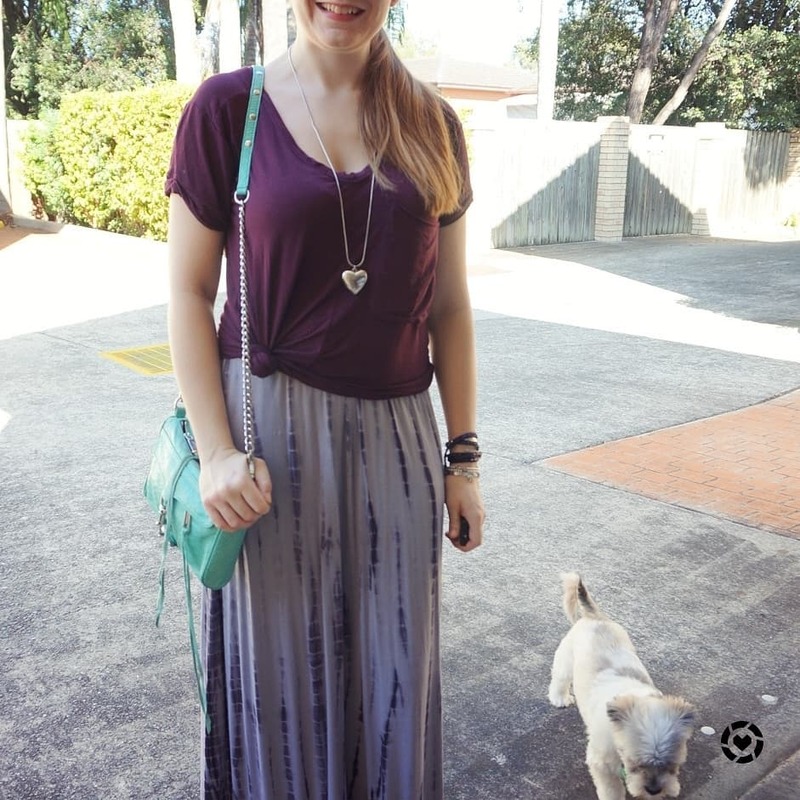 They work so well together and the tee over the maxi makes the outfit look so casual and perfect for everyday wear! I love it! Thanks! I really like blue and grey together too! 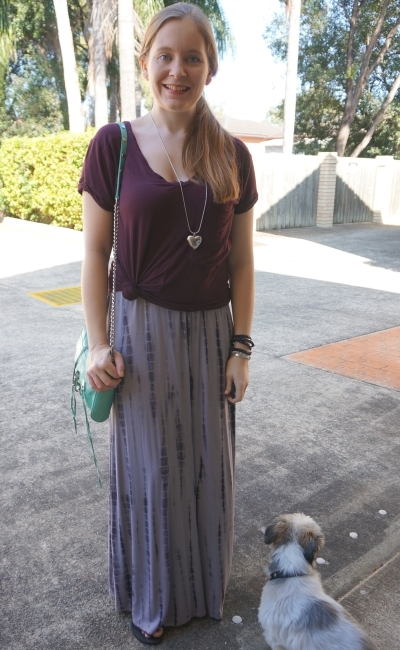 Such a cool idea to put tee over a maxi. I like it that you can still wear it on Autumn which is actually better than summer where you get really hot in maxi. I hope your boys are doing better this weekend. I took my toddler yesterday for his 4 year old immunisation and had a bad night prior to sleep. Wishing you a relaxing weekend. Yes it's a nice way to be a little warmer in autumn! Luckily the boys weren't too cranky after their immunisations! Dear Mica, such a great outfit formula! I think I have never worn a maxi dress with a shirt over it but the idea is cool and I see you feel well in those combinations. How good your husband had his day off when you had this challenging morning - no wonder your boys felt asleep at home! Happy weekend! 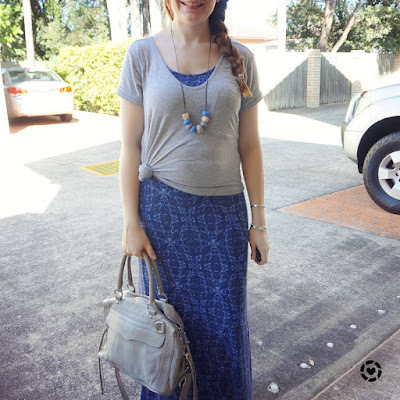 The tee over the maxi dress is such a cute idea! I don't know why I never thought of layering a t-shirt over a maxi dress before - it feels like such an obvious thing to do and how handy to get a few more combinations out of the pieces too! It's always good to come up with new ways to wear things! Glad to introduce you to it. what a fun event to attend! cute outfits! Great look Mica! Good idea! Great idea to extend the maxi dress into autumn and beyond! The aqua mini MAC is actually pretty versatile - it looks fab with those colours! Thanks! 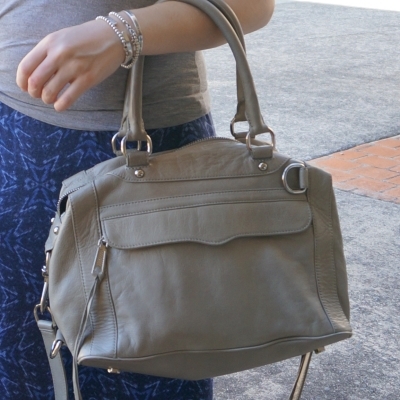 It really goes with so much, it's such a great bag! I love that blue skirt. Hope the injections went well, must be awful taking them! It is so tough for them, poor babies! But they were over it quickly. I never would have thought that first tee was layered over a dress! What a great idea! It is a great way to make a dress look like a skirt! haha, he is the cutest! Oh, you know this is something I've never actually tried before - what a lovely idea! It's also ideal for if it's a little too cool to wear a maxi dress on its alone, or alternatively, if you've burnt your shoulders the day before haha ;) Have a fabulous week ahead! haha yes it would be good for sunburn! I'm glad I could introduce you to the idea! Yes it's a great way to make a new outfit from old favourites! A tee with a maxi dress is good! And I like your maxi dress tho! Layering over a maxi dress is such a nice way to get more use out of the dress and depending on activity really helps tone it down. I love that the dress peaks through on the top as if you are wearing a bralette or sports bra. I get weary about flashing people with lower necklines and I like how the dress prevents this from happening. Of course, I have to give a shout out to your bags! Love love love them both! Thanks Maureen! It's definitely a fun way to layer! I have actually never done a tee over a maxi dress before, so that's a new combo to me! It looks great though, really easy going! Glad I could introduce the combo to you! The layered look is so cute! Hope you had a great weekend! I really love the tee over the maxi. A great way to get more use out of your closet. So nice when Dad's can come along and help out with shots! Yes I'm so glad he was there to help!